Figue Mediterranean Restaurant (47474 Washington St., La Quinta, CA; 760-698-9040; eatfigue.com) is going to transform the desert summer into a glorious food and wine holiday via its Summer Culinary Tour that launches on June 1 and runs through the end of September. This "voyage" to the Mediterranean begins with Italy in June, then moves on to France in July, Spain in August and Greece in September. The Summer Culinary Tour is a food lover's adventure, featuring special menus, wines and cocktails, cooking classes, wine tastings and other exciting activities which celebrate the colorful and delicious food and wine traditions of the Mediterranean region. The Summer Culinary Tour will take Figue's guests on a vacation to the Mediterranean region without having to leave the Coachella Valley," said Lee Morcus, owner of Figue. "We are raising the bar on how to have a great summertime in the desert. We appreciate that the residents of La Quinta as well as those from the neighboring communities of Palm Desert, Palm Springs, Indian Wells, Desert Hot Springs, Rancho Mirage, Bermuda Dunes, Cathedral City, Thousand Palms, Indio and the Coachella Valley don't want to spend much time outdoors during the hottest months. Which is why they will be excited to learn that Figue is taking them, throughout the summer, on an amazing food and wine journey that never leaves our beautiful, air-conditioned restaurant and gathering place." 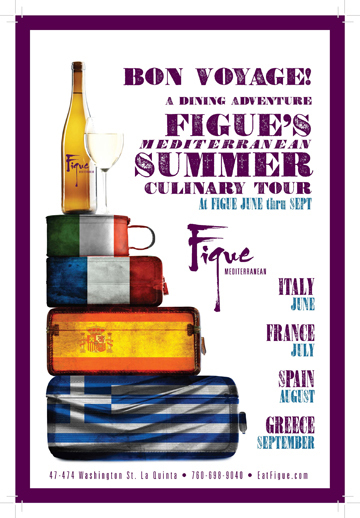 Figue Mediterranean has organized the Summer Culinary Tour into four one-month stops at special "ports of call." 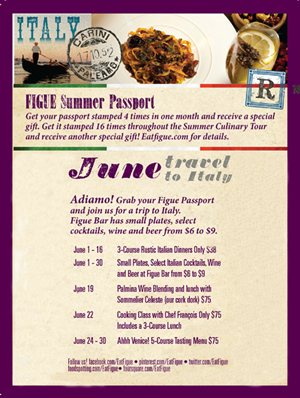 The Tour begins when Figue says "welcome aboard" by giving each guest a special Figue Summer Culinary Tour Passport, which is stamped each time they dine at Figue during the summer. Just as guests would experience if they were to go on a Mediterranean or European food and wine tour, at each stop they will enjoy authentic foods and wines that would be featured in that part of the Mediterranean. Everything is made from the finest, freshest, organic ingredients. Primary ingredients are sourced locally and regionally while others are imported directly from the Mediterranean area. At each monthly stop, guests will be able to enjoy a 3-course special prix fixe menu (in addition to the regular menu), and Figue's bar will serve special appetizers, wines and cocktails from that country. In addition there will be special activities for food lovers who want to experience that region's culinary culture in a more hands-on way. There will be cooking classes led by Executive Chef François de Mélogue, who has spent much time in the Mediterranean region. There will also be wine blending workshops and tastings and special multi-course tasting dinners. As the Summer Culinary Tour unfolds, there may be some special surprises added to the calendar. These will be announced as plans are finalized. "We are so excited to create this kind of food and wine experience for our guests," said de Mélogue. "To make the Summer Culinary Tour outstanding, we have chosen a wide range of dishes that represent the variety of flavors and ingredients for which these regions are known. Many ingredients will be familiar, but some will be the 'best kept secrets' of that particular region. Our goal is offer something for everyone who enjoys good food and wants to learn a little more about Mediterranean cuisine. Everything will be super-fresh, flavorful, refreshing and slightly out of the ordinary. That's what a food and wine adventure should be all about." Italy will be the first stop on the Tour, throughout the month of June. Among the special activities planned is a 3-course Rustic Italian Dinner Menu ($38 per person), available from June 1 through June 16. Throughout the month, Italian Small Plates will be served in the bar area, also featuring a selection of special regional wines and cocktails. On June 19, Figue will host a lunch time Palmina Wine Blending ($75 per person) which includes a 3-course lunch. Chef de Mélogue will lead a lunchtime Cooking Class on June 22 ($75 per person) which includes a 3-course lunch. During the final week of the month, June 24-30, enjoy "Ahh Venice! ", a 5-course Venetian tasting menu ($75 per person). "Figue's Summer Culinary Tour is going to be a major highlight of the summer in La Quinta," said Morcus. "We hope that everyone from this wonderful area will join our growing following of people who have discovered that Figue is an exciting and exceptional-yet casual and friendly-new restaurant. Every day from June through September, during the Summer Culinary Tour, Figue will also be the best oasis in the desert!" For more information about Figue's Summer Culinary Tour, please visit eatfigue.com/events.